Sorry... Discussion Group is currently ON BREAK. It will resume next January. The discussion group provides an opportunity for anyone who wishes to learn about Buddhism to engage in group study and discussion. Sessions begin with brief chanted prayers, followed by readings and discussion from the study text. The group discusses the material in an open, and relaxed atmosphere. Everyone is welcome, beginner to experienced practitioner! We are currently discussing "A Complete Guide to the Buddhist Path", by Khenchen Konchog Gyaltsen Rinpoche. Drawn from The Jewel Treasury of Advice, a root text written over three hundred years ago by the Buddhist master Drikung Bhande Dharmaradza (1704-1754), the reincarnation of Drikung Dharmakirti, Khenchen Konchog Gyaltsen Rinpoche interprets these ancient teachings with compassion, strength of mind, warmth, humor, and a keen awareness for their place and need in contemporary Western life. Buddhist teachings provide numerous ideas and methods for bringing greater meaning and happiness to our lives and to our relations with others. In this book we are introduced to these methods through an intimate advice-style commentary in direct, down to earth language. Khenchen Rinpoche has said that this book is like a companion to the Jewel Ornament of Liberation, and studying both texts at the same time is quite useful. 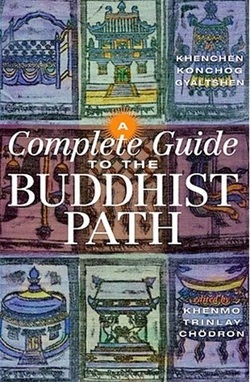 The Complete Guide to the Buddhist Path is available for sale in our bookstore. Please join us!